The magnetic mine — as distinct from the more familiar floating contact mine (the one with the spikes, familiar from the movies) — lies in wait on the sea bottom. A ship passing tens of metres above (unless 'degaussed') distorts the normal Earth's magnetic field enough to trigger the mine. This was the first model dropped in coastal waters by the Germans early in World War II. 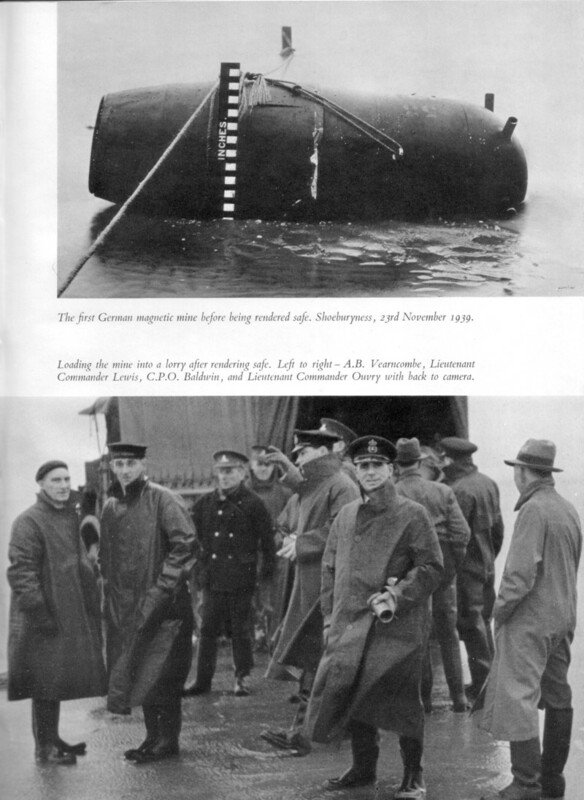 You can see a photo of it as it lay on the mud flats in 1939, together with a picture of Lt Cdr John Ouvry and his crew — who actually did the hazardous job of defusing it — on HMS Vernon's own History pages. November 2009 marked the 70th anniversary of the events described above, and you may be interested in an expanded account (pointed out to me by a reader) of the situation in late 1939, and the Royal Navy's role at the time, that was posted at that time here. 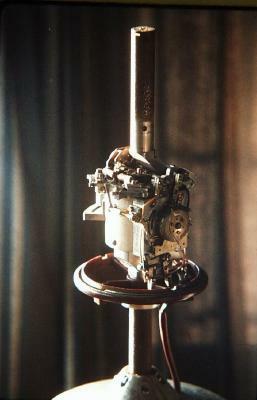 The magnetic 'needle' is buried in the centre of the mechanism. The vertical rods above and below are 'mu-metal'* field concentrators. 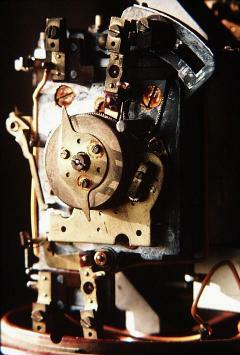 The whole unit was also sheathed in mu-metal, and swung in gimbals so that it remained in the orientation shown. In response to an assertion on a forum (which I'll leave unnamed) that this means it would still work after lying on the seabed after 60+ years, I should point out that the current battery is a consumer 6V pack that has been changed many times! * mu-metal is an alloy of iron, nickel, chromium, and copper. A page with photos and description of a slightly more complex model, allowing several ships to pass before it actually explodes can be found here. Those photos also show the enclosing mu-metal cylinder which I omitted from my shots. 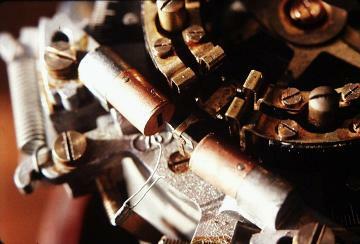 A fully-wound clockwork motor is held in check by a spring-loaded fuse. When the mine lands on the sea-bottom. this fuse is blown, releasing the motor. This slowly adjusts an internal balancing magnet until the magnetic needle actually trips; this blows a second fuse that causes the adjustment to "back off" a specified amount, and triggers a second clockwork mechanism (on the opposite side — not visible in these photos) that resets the detector. The next time it is triggered, it will detonate. The visible part of the trigger is seen here. (The actual magnetism-sensitive element is deep inside.) The two 'copper' cylinders are actually also little magnets: their function is to grab the T-shaped element seen in the centre of the picture as soon as it deviates (due to a changing external field) far enough from the neutral position. This increases sensitivity, and ensures that the contact points — visible a little above and to the right — make firm contact. There are two approaches to countermeasures for a weapon like the magnetic mine: you can find a way to destroy it before it can find a target, and you can make the target 'invisible' to the mine. Both approaches were successfully pursued by Charles Goodeve and his department. 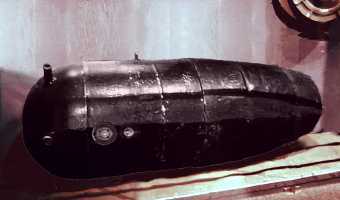 The "Double_L Sweep" used a heavy pulsed current between long cables towed behind two (wood-hulled) ships to generate a strong enough field to blow up mines within that area. The magnetic mine only worked because ships' hulls concentrate the earth's magnetic field (N-pole down). Applying a sufficient reverse field for a short period would leave the hull magnetized in the 'wrong' direction and thus counteract this increased field, rendering the ship undetectable (for a while). The most efficient way found to do this was to 'wipe' a current carrying cable loop up and down the entire hull.